Often efficient people suffer ignorance since they cannot prove their worth or value at the work place. There are some methods to be noticeable at workplace and to get acknowledgements and be happy. The unemployment rate is increasing everyday than it is in the past while for a lot of companies, production isn’t precisely thriving. In this scenario, the best way to secure your job is to show your employer that you are so important that they just can’t let you go. It is obvious that you do not want to regret working on something you dislike, hence clear your head and find out what you like. If you are interested in teaching, you should teach and not sit in an organization doing accounts! This way, neither will you be happy nor can you give your best to receive compliments. So, choosing the right job is the first step to make yourself noticeable and valuable in your organization in the coming days. Companies value employees who comprehend and own a willingness to work hard. It is also important to work smart. This means that one has to learn the most efficient way to complete tasks and find ways to save time whilst completing every day assignments. It is also significant to care about the job and complete all projects with a positive attitude. Exhibiting more work than expected in the job is a great way to show your good time management skills. Do not utilize the company properties for your personal benefits. Calling to your personal numbers and accessing to the internet for own time pass is considered to be bad work ethics. Try not to ask for favors from someone, until you have done something great to help that person. You may know a lot, but when someone else is speaking keep quiet and listen to the person. You may get some new information from his/her speech. You do not necessarily need to display your knowledge in front of your seniors or even others; nobody likes a person who shows off. If you do not know something, try to find out about it. Ask people, research in the internet, or dig into books but never pretend to know something you don’t! That will put you in danger and will decrease your value as a genuine person. Be it entering the office at time or finishing off a report on time, punctuality matters. If you promise to deliver a report by 7pm make sure you finish it by 6:30pm and keep the half hour for corrections, then deliver it on time. Meeting a deadline can be a challenge at times, but learn to manage your time. Never fail what you have promised your boss. In case you are in doubt of your timeliness, let it be known to your boss, as you do not want to shock him! Clarity and transparency always work in favor. So, always try to inform about any unexpected or unintentional delay in advance. It can work wonders if you make sure that your managers understand your effort and good results. You will have to speak about your work and make it known, but remember not to be too loud about it. The supervisors and managers may notice your efficiency and get you a salary hike or even better. So, promote yourself but in a subtle way. Do not overdo your self-praising, as it may bring upon the opposite result. Do not preach stuff you don’t follow yourself. If you advice your juniors or colleges to do something, you better be a follower of the same path. Otherwise, people will take you for granted. So, remain true to your own self and only exhibit what you are and what you truly believe. Do not hesitate to put forth your view, if you have a strong one. It may help the organization. Also be ready to face criticism, it is your job to protect your view. You must be able to defend your point of view and ideas, once you are questioned. Your confidence and convincing way to present your view will make others get convinced and lay their trust on you. You must be fluent in both the verbal and written form of the languages used at your workplace. If you fail to communicate with the other employees, you will automatically be neglected. With the new forms of electronic communication today, our conversations are becoming increasingly impersonal, try and maintain a balance. Remember to behave well with your fellow mates, nothing surpass a well behaved man/woman. Good conduct can save you often at the workplace. But do not try to be nosey with others, it may irritate them. When some important matters have been intimated or discussed make sure you have a copy emailed to your boss. Also know the difference between real communication and e-communication. Communicating with people is prospect not only to convey information, but also to build associations with them simultaneously. Build a good list of valuable contacts both online and offline. Employers look for employees who are adjustable and maintain flexibility in finishing tasks in an ever evolving workplace. Being open to modification and improvements provides an occasion to complete work in a more proficient manner while offering added benefits to the organization and the clients. You should learn from your mistakes, and act wisely in future. It is better to stop complaining and trying to get adjusted to fit into the scenario. If you make yourself flexible, then others will do same too. New policies, thoughts, priorities, and work habits may promote a faith among workers that the management and staff are both committed to making the agency a better place to work. But that does not necessarily mean you will have to work harder and increase your workload. Do not burden yourself up with extra work, or you may be burdened with additional work all your life and get frustrated. Do not offer to fix something until it’s actually wrecked. A good intuition can help you in making progress in your business, many a times it happens that our sixth sense acts very effectively. If you have a feeling that someone is a bad influence, he/she probably is so. Hence maintain distance from them. Keep away from the office bullies, if you are new at a corporation. It will create a good impression of yours in front of your employers and superiors. There are times when you should stop being too modest and speak up. There are several other employees in an organization; therefore you are not the only one to take the entire headache. Denying responsibility is bad but getting overloaded with work is equally worse. Saying ‘no’ can be done politely and effectively, or you may have to be in fear of your boss all your life and have no peace of mind. Do not discount your worth, never work for free. Just because you know someone dearly, does not mean you have to arrange a discount for that person. This may eventually hamper your business. Be professional at workplace, and keep friendship and love away from the campus. Maintain a healthy competition. In turn it will increase your value only. Save all the conversations and e-mails sent and received to cover your back and as a verification. If someone has asked you to do his/her work, make sure you have the request saved up for future reference, in case he/she denies your help or puts the blame on you for something regarding the subject. It is always advisable to save all information properly. Offering for a higher position does not help always, as it may not suit you. If you want to be responsible for the success or failure of your company, or if you are ready to do overtime almost every day, move up the ladder of hierarchy. But in case you want to go home in the evening and enjoy meal with your family everyday and don’t want to worry about work until the next morning, opting for a higher position is not yet your thing. Do not indulge so much into work that you forget to eat or drink. Take small tea breaks and walk out of the office, breath some fresh air and stretch. These ten minutes breaks are very helpful to your eyes as well as the mind. It will help you think clearly. It shall be better if you leave a spare coat hung on the back of your chair, to make your presence felt by people around. Never drag your feet, sigh or yawn loudly inside your workplace, it creates a very awful impression. You do not need to show your tiredness and disgust to a room full of people. Try to be as active as possible. Being a trusted resource of a company you should share information in the courage of continuous learning and development. You will have to know a lot of details of the organization you are working for. Share with your colleagues if you see something interesting in the media about the company or the competitors. Once you share this information, offer your thoughts and an initiation to listen to what the receiver of this information thinks. Above all, live as an optimist. Your life can be better only if you want it to be. Keep a smile on your face and when required let out the frustration, but keep in mind not to harm anyone with your attitude. Rather try to enhance others by your positive energy; this will eventually bring about good results in the business. Your mundane life can become colorful if you have certain diversions and entertainments other than living your life for your organization. Hobbies like photography, philately, gardening, and skiing, camping, taxidermy, painting and cooking can brighten up your holidays and recharge your battery for a better restart at work. There should be some interesting stuff for you to indulge into during the weekends, you may also be into reading, watching films, playing sports and fishing. Doing what you love the most will always bring a smile on your face and revitalize your life. Remember if you are happy inside you will be happy outside and will be able to give your best in every case. 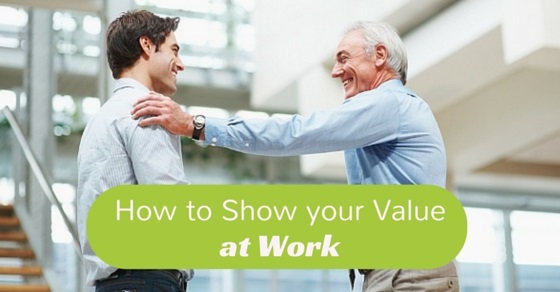 Hopefully, the tips may help you achieve and show value at your workplace. Remember, the best way to show your value at work is to understand your own value first. So, explore yourself, discover your strength and weaknesses and you will be ready to get successful in your work place. Feel free to let us know your feedback and share your experiences at work.